For better comfort and control, this Hitachi C10FCF2 is a great option. It brings you ultimate performance, thanks to its adjustable bevel. Apart from high-end performance, you also get five year professional warranty. Things you get inside the box include – extension bars, material clamp and laser. It is quite lightweight and portable. It features a sturdy axial-glide system providing durable precision with quick turnaround. For the ultimate control and comfort, it has a big form-fitting ambidextrous trigger handle making it a perfect choice from all aspects. Coming with a vertical cutting capacity of 6-1/2-inch and horizontal capacity of 14-inch, the Bosch GCM12SD combines an easy-to-read bevel uniform. If you’re after Dual bevel compound miter, look no further than DEWLAT DWS780 as it contains everything necessary to bring heavy duty performance. The detent plate is made from stainless steel material and features 10 stops to provide improved productivity and accuracy. You also get 3 year Limited Warranty. Coming with an improved expanding base extension, the product offers 29inches left-to-right expansion for extra work-piece support. The miter detent features an easy-to-access, thumb-activated override and the bevel controls are placed on the sides to make sure you enjoy easy access. The DEWALT DW715 combines a new handle design and miter system, making it more portable and flexible. The detent plate features 11 stops and is made from stainless steel material providing additional precision and control. 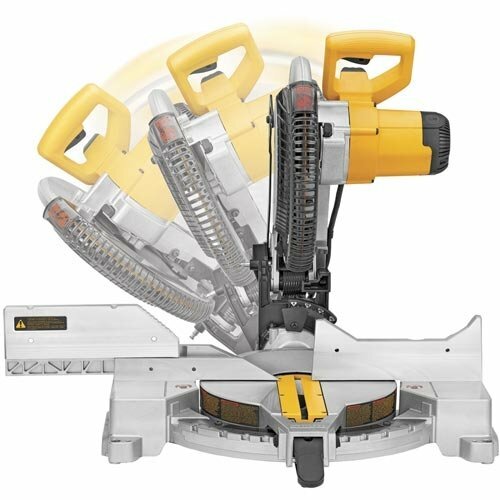 It’s one of the best miter saws for home use.